Hi, I’m Rosanne…but all my friends call me Rosie. I’m a stay-at-home mom and have been sewing since I was 8 or 9 years old (I can’t quite remember as it was a long time ago). My Mom and Nana were keen sewers and there would always be scraps of fabric lying around. I would make doll clothes by hand at first and then Mom was given my Great, Great Grandmothers sewing machine that you had to wind a handle on the side to make it sew. Mom had it serviced and let me use that for quite some time. I have vivid memories of when I graduated to Mom’s electric sewing machine…wow what a moment! At around 12 or 13 Mom would take me along to stretch sewing classes to keep her company and I loved the idea of making my own doll clothes in the fabric I wanted, changing the designs and finishing them off with my own little touches. Time flew by and before I knew it, I had my own children. When Alyssa was about 3, Santa left her a beautiful doll at the end of her bed. She absolutely loved this doll and it wasn’t long before she was asking for some new clothes for this doll. I couldn’t believe how much the retail stores were asking for doll clothes, so out came my sewing machine again. As I used to make my own doll clothes when I was little, I thought it would be fun to make some for Alyssa! Gee, time tends to play tricks on our memory as I couldn’t believe how tricky and fiddly it was. I couldn’t remember having so much trouble when I was a kid, BUT I was trying to sew doll clothes the same way I had learnt over the years to make adult clothes. After a lot of frustration, and years of trial and error, I discovered the many secrets to the art of sewing doll clothes and Alyssa ended up with a huge wardrobe for her many dolls. I was getting lots of compliments from envious mothers so it wasn’t long before I was selling my doll clothes to friends and at the local markets. 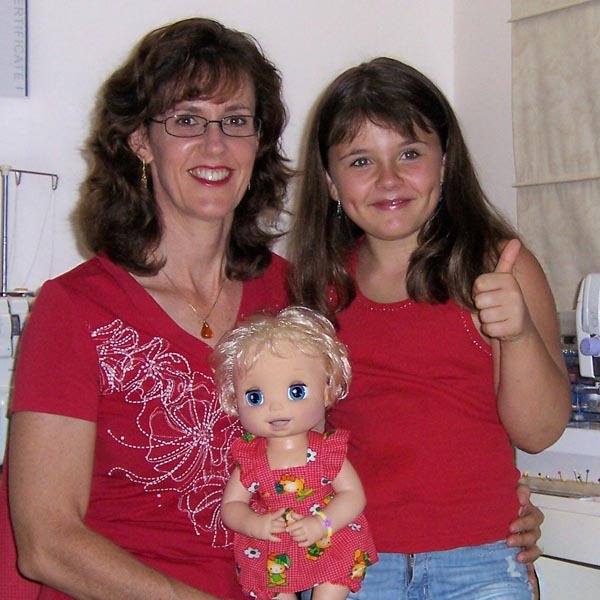 Seeing the excited expression on girls’ faces as they chose an outfit, or more often outfits, for their favorite doll fuelled my passion and before long I had a thriving business on the internet with Rosie’s Dolls Clothes. Now I want to share all those secrets I discovered on how to make doll clothes the super easy so that you too can sew clothes for your child’s favorite doll. Because I have made the How to Make Doll Clothes course in video format, it is like you are in a virtual classroom and you can see each step being demonstrated clearly. You don’t have to interpret complicated instructions and you can work at your own pace. I also want to share my American Girl Doll and Cabbage Patch Kids Doll clothes patterns with you as I know how hard it is to find good doll clothes patterns and I will be adding new patterns regularly. All my patterns come with LIFETIME access to my detailed video tutorials so you can see every step being clearly demonstrated. Why not let your child have a go at sewing their own doll clothes…imagine how proud they will be when they dress their doll in an outfit they made themselves! By popular demand I have also made a comprehensive How to Use Your Serger video course. There are over 2 ½ hours of in-depth instructional videos where I cover everything from understanding the basic parts of your serger and how to maintain it, you’ll learn the basic stitches and then work through to doing fancy stitches, gathering and attaching lace. After doing this course you’ll no longer fear changing threads or adjusting the tension dials, you’ll be confidently using your serger and well and truly on the way to Loving your Serger.